John Kocka M.D. is the Medical Supervisor of Brecksville Physical Medicine & Age Management and Revive Medical Spa. Dr. Kocka trained in the Cleveland Clinic health system where he completed residency in Family Medicine with special training in preventive and sports medicine. Prior to founding Premier Health Clinic, his family medicine, sports medicine & wellness practice, he was the Medical Director at the Twinsburg Urgent Care and Twinsburg Health & Wellness Center. Dr. Kocka has previously served as the Medical Director of the NASA Glenn’s Medical clinic and Fitness Center. In addition to his Board Certification in Family Medicine, Dr. Kocka is board certified in Age Management from the American Academy of Anti Aging, the Age Management Medical Group and certified by the Cenegenics Medical Institute. He is a member of the International Hormone Society, International Society For the Study of the Aging Male and the American College of Sports Medicine. Dr. Kocka is a Major in the Air Force reserve, serving with the 910th medical squadron where he was appointed Chief of Ancillary Medicine and Lead Medical Review Officer. He has consulted and trained the medical staff in several integrative medicine practices and numerous practitioners on a variety of musculoskeletal injections. Dr. Kocka offers unique knowledge and experience outside his physician experience. 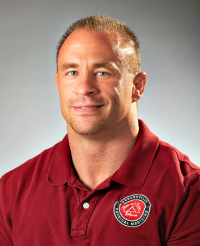 With his interest in combat sports, he has been a ringside doctor for the Ohio State Athletic Commission including physician for the Ultimate Fighting Championship. He has won multiple natural bodybuilding and martial arts competitions and is a former coach at Strong Style Mixed Martial Arts. Dr. Kocka stopped competing but his passion and commitment to weight training, functional training, exercise, nutrition, and health remains; serving as an example to his patients. Dr. Kocka believes in practicing the medicine and lifestyle he preaches to his patients.